CERF is a secure, 21CFR11 compliant software product designed to create, capture, store and manage records, workflows and documents. CERF allows organizations to enjoy greater efficiency, dramatically improved accuracy, configurable regulatory compliance, precisely controlled collaboration and easy oversight, all in a single, stand-alone system. CERF is extremely flexible. It supports the file formats and scientific data types you already use, and includes a wide range of management tools for SOPs, samples, ontologies, digital signatures and more. CERF is ideal for Discovery, GLP or FDA regulated labs, or organizations that want to observe ALCOA-PLUS good documentation and data integrity practices. 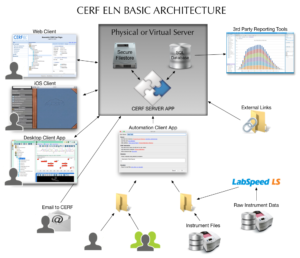 The CERF ELN system consists of the CERF server, where your data is kept, and any number of CERF clients, which allow users to create, access, import, export, and annotate your data records. For long-term sustainability and security, we recommend that the server be installed on a physical machine on your site, but you can also choose a virtual or cloud based host of your choice. The server consists of the CERF server application, the secure file store (where attached data files are kept in their native format) and a referential SQL database that ties the whole system together. The free CERF client application, used to access the server, is available for Windows and Mac OS. A free Apple iPad application is also available on the iTunes store. You may install the client on as many computers or iPads as you like. Scientists can log in from any computer with the CERF client installed and immediately start work. Their data is stored not on the local workstation, but on the central secure server. Licensing is perpetual and is based on “seats”. You pay for access by specific named users. If a user leaves your organization, the vacated seat becomes available to someone else. Enjoy the functionality of an Electronic Lab Notebook (ELN), Enterprise Document Management System (EDMS), Laboratory Information System (LIS) and Scientific Data Management System (SDMS), all in a single solution. 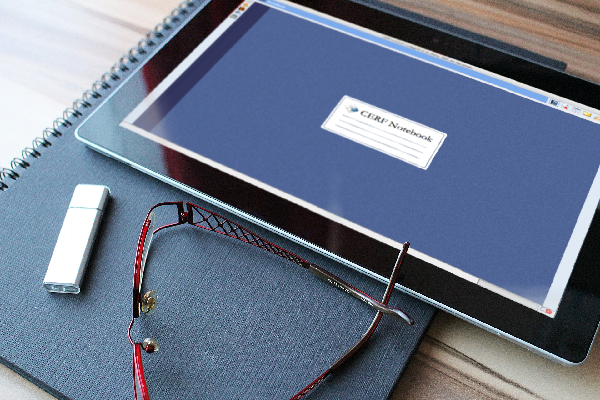 CERF can also fill the gaps between systems too, helping you capture and version key knowledge assets that may be critical during audits or due diligence investigations, but which other systems have failed to capture. Organize, manage, version, and share documents. Old versions of documents are never deleted or overwritten and the full history of the document is easy to access. All actions performed by all users and admins are recorded in a detailed, easy-to-read audit trail that can be filtered to show only what you currently need to know. This system-wide history can be exported with a single click for further analysis. Reduce time and effort used to maintain lab data, distribute SOPs and documents, sign and witness notebooks with 21CFR11 compliance, and ensure proper role-based access to data that balances the needs of privacy and security with the benefits of collaboration and oversight. Create dynamic, easy to manage subpopulations of scientists with role-based access to specific subsets of data. It’s easy to give everyone full access to everything, or control access very tightly with read only, annotation, edit or other privileges assigned as appropriate. Protect your IP, but simultaneously promote useful collaborations with scientists inside or outside your organization. We will work closely with you to show you how to organize your entire staff into logical Workgroups with appropriate access roles. Create, manage, and access data and lab records across any platform (PC’s, Macs, and Apple iPad). Collaborate with anyone, and send data to CERF from any location with network access. If you know you are going somewhere with no network access, for example on a flight to a conference, you can check out CERF resources, work on them offline, then check them back in when you next connect. Obviate the inefficient, unregulated and potentially insecure use of external thumb-drives, email, drop-box or other methods of sharing files between and communicating among colleagues or collaborators. Find and monitor or reuse data, documents, or specific versions of documents 24/7 whether in the lab, office or field. Reduce search times by associating rich semantic metadata, annotations, tags and captions with all your files and resources. Build custom lists of controlled vocabularies arranged in logical ontologies that you can use to unify the way you identify and categorize information across your entire organization. CERF can even automatically extract existing embedded metadata from files as you add them. Use full text search, metadata searches, Boolean logic and structured queries with unlimited combinations of search parameters to easily locate a single document, experiment or data set from amongst years of diverse research assets. Give rich searchable meaning to data that is otherwise hard to search for. Add captions and searchable annotations to images, and graphic or textual overlays to verbose data that can tend to lose their significance or overwhelm a downstream audience not present during the original research. Avoid duplication and reinvention by providing better location and comprehension of data today and far into the future. Link resources together in logical ways and allow them to be used in multiple contexts, with or without automatic version update. See quickly how different experiments, literature and documents are related, and how your data has evolved or spawned new lines of research over time. Enjoy piece of mind, knowing that all of your data is safe, secure and accessible into the indefinite future, regardless of trends in technology, or the CERF product itself. None of your data will ever mysteriously vanish from your lab or organization ever again. Data stays safe and ownership is clear, despite staff turnover, room changes, computer replacements and institutional reorganizations. We will work with you to recommend backup, export, automated offsite archive and security strategies that fit your needs. Export some or all of your CERF data and metadata at any time with help from the CERF Exporter App. Alternatively, create locked or editable reports that summarize your research for fast communication with managers or PIs. Move data to other CERF servers, or subdivide your data into different domains as needed to match your organization’s shifting hierarchy and changing CERF use. CERF gives you the balance you need between data permanence and data mobility. Use flexible real-time collaboration features to find information and expertise in your lab, department or entire organization. Know instantly who has worked on related subjects or with specific protocols in the past. Allow remote users to send files to the system via dropboxes, email or by direct connection to the secure server. Train the system to match your needs by developing and sharing sophisticated templates and controlled vocabulary and tags that help maintain consistency and organization-wide conventions. Turn ANYTHING into a template that can save everyone time. Templates can include intelligent place-holders for data that is not yet available, batches of processes or experiments, supporting literature, protocols, forms with line-item completed action sign-off, empty files configured with your preferred header or style settings, or indeed anything you do frequently, no matter how specialized. We can show you how to turn almost any workflow into a template that will make your lab more efficient. Use the Structured Data Information Management System (SDIMS) Module to create forms and data entry tools that allow rapid capture of repetitive data points and longitudinal analysis of large complex data sets, as well as centralization of structured data from disparate sources. SDIMS can even be used to manage samples in ways that tightly integrate with your Lab Notebook and help you see the history of your samples. Keep your lab in full compliance by using CERF to distribute and manage SOPs, protocols and other controlled documents. Monitor and enforce signing, expiration and proper usage by authorized individuals in any research project. This feature alone can save thousands of dollars by replacing third party systems or contractors. Use the CERF Automaton to filter and route any type of data to CERF from anywhere in your organization. This might include data generated by scattered instruments, incoming emails and email attachments, network drives, shared remote folders, dropbox folders and even voice annotations and photographs from mobile devices. Use our network linking feature to link to large files outside of CERF without having to physically copy them them. Use your current workflows and favorite applications. CERF’s check-out / check in model works with the software you use today to minimize change of user behavior and maximize adoption. We will train your users so that they will use the system properly, and benefit fully from it. Drag and drop simplicity. You can drag any file in any format from any source directly to CERF and immediately see a representation of your data inline. In most cases you can even interact with your data without having to open the external application that created it. You can even drag and drop entire nested directories to CERF file cabinets, and the internal directory structure will be faithfully recreated. For end users who do not want or need to know more, drag and drop of selected items is just about the only action they need to use CERF. Administrators and PIs have instant, granular control of all CERF server behaviors. View data and monitor server status, user logins, and data access from anywhere using the simple administrator’s web interface. Flexible implementation models and simple infrastructure needs. 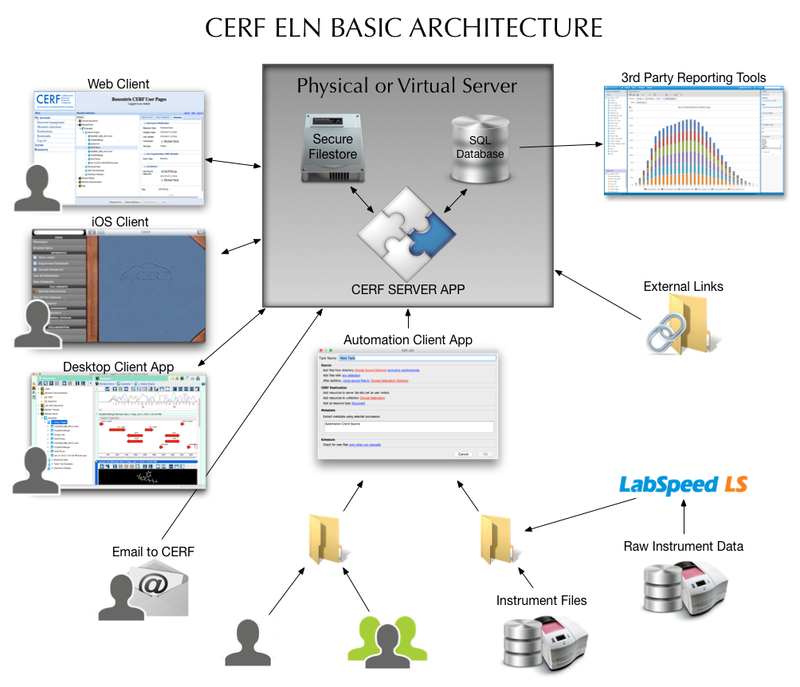 We have deployed CERF in almost every conceivable IT environment. We will work with your IT staff to make sure that installation and deployment goes smoothly and makes your IT department and managers happy. CERF requires almost no IT maintenance from the customer and Lab-Ally provides all necessary help, documentation and support. Lab-Ally was founded by scientists. Our professional training and support is the best in the industry because we know your workflows and understand your challenges. We can assist you with every stage of the deployment and provide extensive training and clear documentation that will ensure rapid adoption by your end users. Responsive, ongoing, committed vendor support is a key element of any large-scale data management project and its importance should never be underestimated. The server consists of the CERF server app, secure file store (with data files kept in their native format) and SQL database tying the system together. Open image to view the CERF architecture diagram at full scale. Key CERF architecture features include the fact that CERF is a modular, extensible product based on open industry standards. Open standards make CERF easy to connect to other systems and ensure that the product is highly sustainable. CERF has a clear update path stretching far into the future, linked to industry trends. Modules and IT technologies that become outdated can be updated and modules incorporating new technologies can be easily added. Your CERF support package includes all software updates (typically two a year) and the updates involve no significant interruption of service. The use of a database and separate files store to hold your raw data means that CERF does not slow down as data accumulates. The referential database in CERF contains only the information about your files. It rarely exceeds 5 GB in size and does not lock your files in a proprietary database from which you may not be able to extract them. CERF is “database agnostic”. By default we use MySQL as our database because it is free, but CERF works equally well with an MS SQL or Oracle “backend” if those technologies are required in your organization. Since all data files in CERF stays in their original, native file format in the secure file store, your data is not tied to this solution, or any particular database company or technology. Your valuable data can always be extracted in the future, regardless of your organization’s future data management strategy, database technologies or vendor decisions. CERF licenses are perpetual, so once you have purchased the software it is yours forever, ensuring maximum sustainability. New features, modules and plug-ins are being added by our world-class engineers all the time. If you utilize a workflow, software product or data type that is not currently tightly integrated with CERF, tell us about it. In many cases we can quickly extend our product to meet your specific needs.